If you think that your clothes turn out as good as new only when the ‘women of the house’ wash them, think again. The new Ariel Matic ‘Share the Load’ pack ensures that the stains vanish and your everyday best is at its gleaming best, no matter who does the laundry. And for the first time in the history of the world, the Ariel Matic pack comes with an Odd-Even calendar so that laundry days are split right down the middle between husband and wife! Yes, it’s no longer going to be just ‘Biwi ka kamaal’, it’s time to make it ‘Miya-Biwi ka kamaal’! To participate in the #LaundryGoesOddEven blogging activity, register on the form given below and tell us a little about yourself. Once shortlisted, you’ll get a chance to try the new Ariel Matic pack with your partner. At the end of the activity, you can chronicle your experience in a blog post. Apart from the assured vouchers that await you, you’re in for an experience of a lifetime! Splitting chores and household duties reduces the time taken to do them, and increases the amount of quality time you get to spend with your loved ones. That, in turn, results in content family members, strengthened relationships and a happy home! Win-win, isn’t it? So, in your blog posts, we want to know about just how much easier life gets when you share the load with your partner! Register now by clicking on the button below! 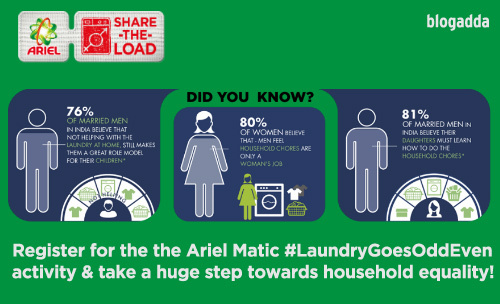 Join Ariel and BlogAdda in eliminating gender inequality, one household at a time, by registering in the #LaundryGoesOddEven blogging activity. The Odd-Even calendar is the way to go for bringing household equality in the true sense. So, dads, husbands and sons, it’s time to share the load! Pick your dates! We’re looking for only 30 male and 30 female bloggers for this activity, so register yourself before the slots get filled. Don’t be the odd person out!